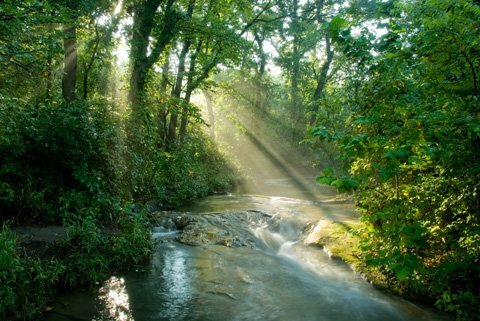 Sunlight streams through lush woods along a creek at Chickasaw National Recreation Area in Sulphur. Oklahoma gets more than 300 days of sunshine a year, which means endless opportunities for picnics. Whether it’s a family outing with sandwiches and iced tea or a romantic feast of wine and cheese, there are infinite places in Oklahoma to enjoy a meal in the great outdoors and we’ve highlighted ten of the top spots for you. For a truly memorable meal, pack up your favorite fare, grab a blanket and head to one of these fantastic picnic spots. Nestled among towering downtown buildings and the buzzing big city atmosphere in Oklahoma City is a 17-acre expanse of breathtaking gardens. The Myriad Botanical Garden is an oasis packed with seasonal plants, exciting water features and lush vegetation as far as the eye can see. Toss out a picnic blanket and breathe in the sweet scent of exotic and native plants throughout the garden. Or, seek out one of the garden’s complimentary tables, many of them shaded, which are scattered throughout the verdant space. Set out on a serene walk through Red Rock Canyon Adventure Park in Hinton to find the ideal spot for your outdoor meal. Settle into a leisurely picnic among the towering canyon walls for a unique escape. The park sits on the land that was once a stop along the historic California Trail, and visitors to this site will glimpse amazing pieces of history including wagon wheel ruts left by early settlers. The park is beautiful year-round, though picnickers are in for a real treat if they visit in the early fall. Crisp air compliments the stunning color changes of the Caddo maple trees that blanket the area with gorgeous hues of red, orange and yellow. The options are endless when you picnic at Roman Nose State Park in Watonga. Spread your blanket near Big Spring to soak in the sounds of a calming waterfall during your meal, paddle your meal to the center of one of two lakes located within the park or dine poolside at Roman Nose Lodge before taking a dip into the remarkable swimming pool. Whether seeking views of expansive canyon walls, impressive gypsum rock cliffs or calm creeks, you’re sure to find your ideal picnic place. Soak up the natural beauty while enjoying your meal, then take a moment to relax and share the park with the wild turkey and white-tailed deer that call the state park home. The calm waters of Lookout Lake provide the perfect backdrop to any picnic. The peaceful water reflecting the rolling terrain and expansive Oklahoma sky at Osage Hills State Park in Pawhuska make it ideal for outdoor dining. Soak up the natural beauty while enjoying your meal then take a moment to relax and share the park with the wild turkey and white-tailed deer that call the state park home. Stick around after your picnic to cast a line into the lake where you’ll find an abundance of catfish, perch, crappie and bass. A true adventure-seeker will love a picnic atop Oklahoma’s highest point. The Black Mesa Summit Trail in Kenton will take you to a picturesque picnic location packed with stunning views, peaceful surroundings and a fantastic feeling of accomplishment all within Black Mesa State Park & Nature Preserve. Travel the trail to view a combination of shortgrass prairie and foothills blanketed with juniper, shrub oak and cacti before settling down at the top for a tranquil picnic. From your dining spot, you’ll see New Mexico and Colorado in the distance. For a picnic with a view, it’s hard to beat the beauty at Tres Suenos Vineyard & Winery in Luther. Start your dining experience in the tasting room where you’ll savor the flavors of local wine and get a tour of the breathtaking vineyard. Buy a bottle and unpack your picnic on the winery’s spacious patio settled under hundreds of shady pine trees overlooking the lush 10-acre vineyard. Rarely do you find the perfect combination of lush surroundings and urban convenience that awaits you at Tulsa’s Guthrie Green. The downtown green space features tree-lined paths, impressive water features and plenty of shade that beckons picnickers. No matter when you decide to toss out your blanket and settle down for your meal, you’re likely to find some type of entertainment at this peaceful escape, where outdoor movies, live concerts and food truck festivals are common occurrences. This cobblestone community of Medicine Park has a fascinating history as a resort town attracting celebrities, politicians and even outlaws. Unpack your picnic on the banks of Medicine Creek and take in breathtaking views of the Wichita Mountains and the quaint shops and art galleries built alongside the water. Enjoy the Oklahoma breeze as you watch trout fishermen angle from the creek and you’ll never want the picnic to end. Whether you're seeking a picnic under a traditional park pavillion or one under the shade provided by nature, you'll find the dining environment you seek at the Chickasaw National Recreation Area in Sulphur. A refuge for outdoor activities for more than a century, pausing for a picnic here means taking part in a nostalgic piece of Oklahoma history. Once a national park, this serene spot boasts streams, lakes, private pools of mineral water and a magical forest of towering trees. Linger over your outdoor meal before tucking into the woods for a serene hike while enjoying breathtaking views of the lush landscape. The gorgeous 54-mile Talimena National Scenic Byway winds through forested peaks between Talihina, Oklahoma and Mena, Arkansas. Bring a blanket and enjoy a panoramic view from one of the 22 designated vistas along the route or score a picnic table and take in some of the best scenery in the Ouachita Mountains. Fall is an especially beautiful time to visit this regional jewel and see the valleys awash with stunning red and gold foliage.